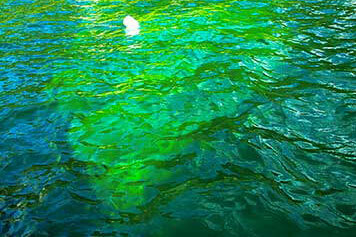 There are interesting features along the Lake which, at present, I can’t fit into other categories. Maybe as the site grows, they will find another home, but for now I have grouped them here as curiosities. For suggestions and guidance as to interesting things to put on this page, I am indebted to Alan Ramsden, Ron Welwood, and Richard Brown. Feel free to tell me of your favourite curiosities around the Lake. A Kootenay Whispering Gallery Perhaps our oddest local feature is the Busk swimming pool. 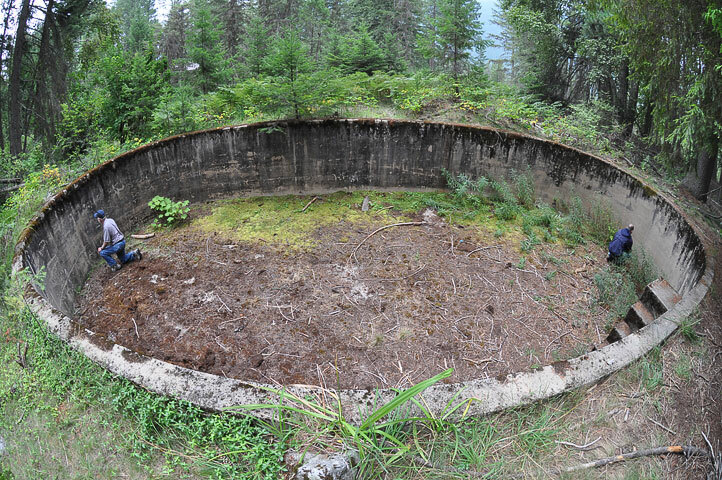 Built in the first decade of the twentieth century on land now within Kokanee Creek Provincial Park, the structure is long abandoned. The elliptical pool has axes of 12 and 6 meters. An ellipse has two foci, which in this case, are 80 cm from the ends. Sound emanating from one focus is concentrated at the other. If a person at one focus faces the wall half way up (an adult should kneel) and speaks quietly, the person at the other focus can hear the voice far better than when closer together. There are only a handful of whispering galleries around the world (see Wikipedia: Whispering Gallery. This one is ours. Pictograph There are over two dozen sites around the Lake with ancient rock paintings. They are typically found on a rock bluff above high water and sheltered by an overhang. 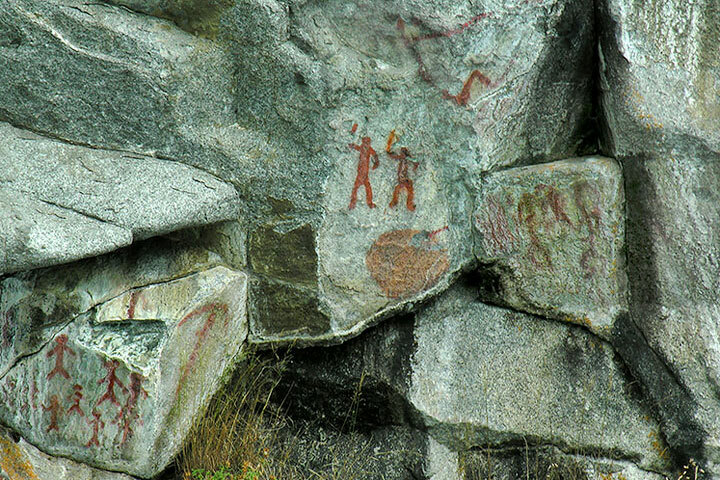 Alas, there is no known connection between these pictographs and the present Ktunaxa or Sinixt: indeed, in the nineteenth century, elderly natives denied any knowledge of who might have created the paintings or what they meant. This pictograph contains three groups of people. To my eye it looks as if the groups in the lower left and in the centre right have just encountered the middle two people, who seem to be brandishing weapons in their right hands. Part of the symbol above them may be missing. Does this scene depict a chance encounter with interlopers? If so, the two are somewhat outnumbered. Pictograph, modern This rock painting located beside the road about two kilometers from the Orange Bridge used to read, “Cabins $5.” It promoted the long-gone Kokanee Lodge at Clothesline Point (cottagers, named Wragge, hung out there). But unlike native pictographs, this one wasn’t protected by an overhang and so weathering and lichen have largely obliterated the message—yet, it did outlast the resort. The Nasookin (Ktunaxa for “supreme chief”) was launched in 1913 and retired in 1947. 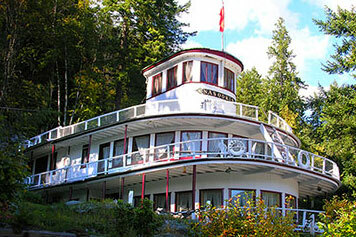 She was the largest of the sternwheelers on Kootenay Lake. In 1949, she broke her back and was sold for scrap. Fortunately, in 1983, her top deck and wheelhouse were retrieved and restored to serve as a private residence, now located about four kilometers along the North Shore from the Orange Bridge. Sternwheeler Kuskanook The Kuskanook (Ktunaxa for “end of lake”) was launched in 1906 and finally dismantled at Kokanee Landing (about 20 km from Orange Bridge and a few tens of meters east of the Kokanee Creek Marina) in 1936. It is close to shore: during the summer, the remaining hull can be seen just below the water (as in this picture), while during the late winter low water (March) it is often above the surface. 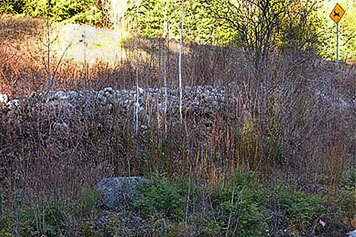 Living Landscapes has a page about the Kuskanook. 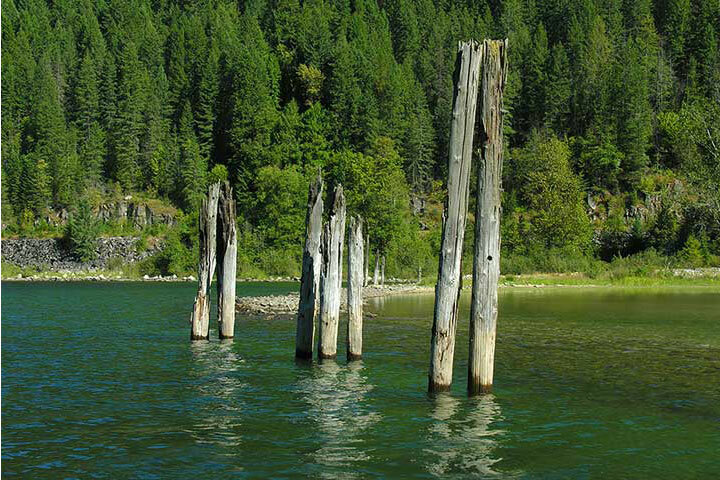 There are a great many old pilings along the Lake; these ones at Troup were installed in the mid 1890s as part of the landing linking trains of the Nelson and Fort Sheppard Railway with sternwheelers of the Columbia and Kootenay Steam Navigation Company. These pilings were still in good shape in the early 1940s, but later that decade, hooligans took sport in setting alight those pilings upon which ospreys were raising their chicks. Ferry ramps at Nelson Just to the west of the Nelson’s Orange Bridge there are a pair of ramps for launching boats. They sit facing each other across the Lake (left side of the picture). Originally, these were the ramps for the cable ferry that linked Nelson with the North Shore. 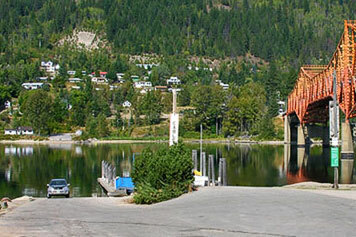 The ferry was replaced by the Bridge in 1957. Before that time, the North Shore had few permanent, but many summer residents; after the bridge, the situation reversed. At night, when you drive across Nelson’s Orange Bridge at a speed of 52 km/hr (slightly over the speed limit), the pickets supporting the hand rail seem to keep pace with the car rather than slipping backwards in a blur. The pickets are about 12 cm apart and the (60 hz) street lights flash 120 times a second. The light flashes, and a picket is seen; the car moves forward 12 cm in 1/120 second (corresponding to 52 km/hr) and when the light flashes again, a second picket is seen in the same position as the first, so it appears as if nothing has shifted. 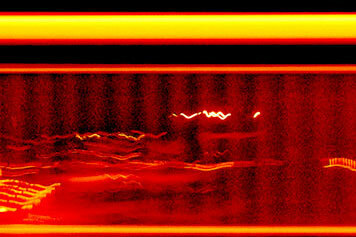 In this hand-held, two-second, exposure from a moving car, each apparent picket keeping pace with the car is a composite of over 200 individual pickets, each one lit only for an instant when in the correct position. Distant lights along the lake are seen through the pickets in this shot. C.P.R. oven The railway from Nelson to Procter was built along the south side of the West Arm in the year, 1900. During its construction, there were large work camps on various creek deltas along the arm where the labourers worked, ate and slept. 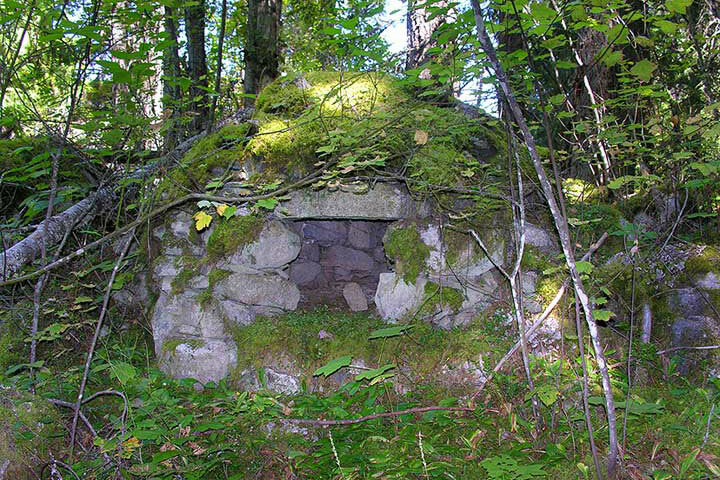 Most of the structures supporting this effort were either insubstantial or portable, and so little evidence remains of these camps. But, a handful of ovens remain. This one, somewhat overgrown after over a century, is about two meters in height. There are hundreds of these brass bench marks around the Lake. 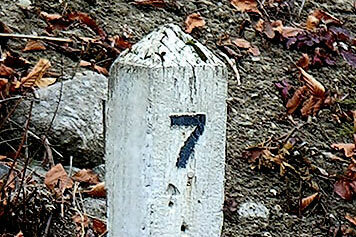 They are mounted on a metal pole and embedded in rock or concrete. 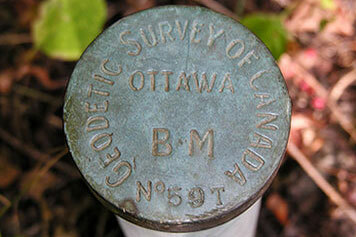 They were installed in 1946 as reference points for the bathymetric survey conducted that year and next. The position of a depth-sounding ship was measured relative to these bench marks. The resulting survey is still the basis of the Lake’s navigation charts that Hydrographic Services has sold ever since. 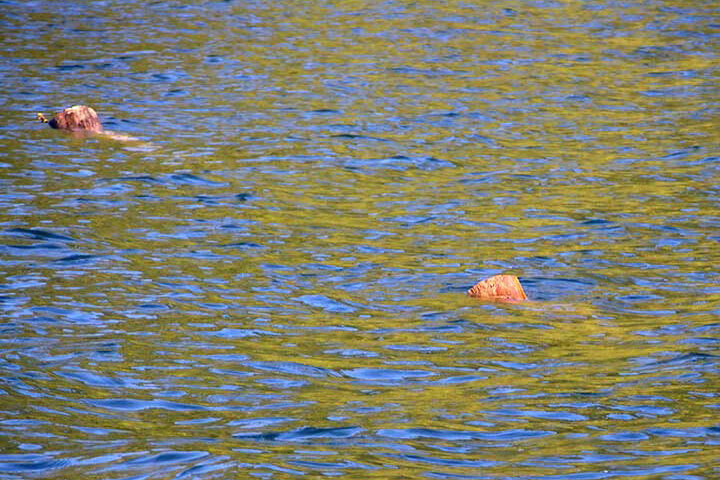 Deadheads east of Tunstall Creek Deadheads are semi-submerged logs; they pose a hazard to navigation at any boat speed other than dead slow they can tear the bottom out of a craft. For years, Kootenay Forest Products moved and maintained log booms along the south side of the West Arm. Inevitably, logs escaped and became waterlogged. When KFP closed in the early 1980s, there was a government subsidy to clean up the deadheads; alas, the subsidy ran out before the deadheads. There are many dozens of deadheads in the bay between Tunstall Creek (Seven-mile Point) and Eight-mile Creek (Camp Koolaree). They are on the Tunstall Creek side of the bay and south of the main channel and so will not be encountered if one follows the channel from dolphin to dolphin. But, for the Lakeside explorer, they are easily discovered by accident—gulp. 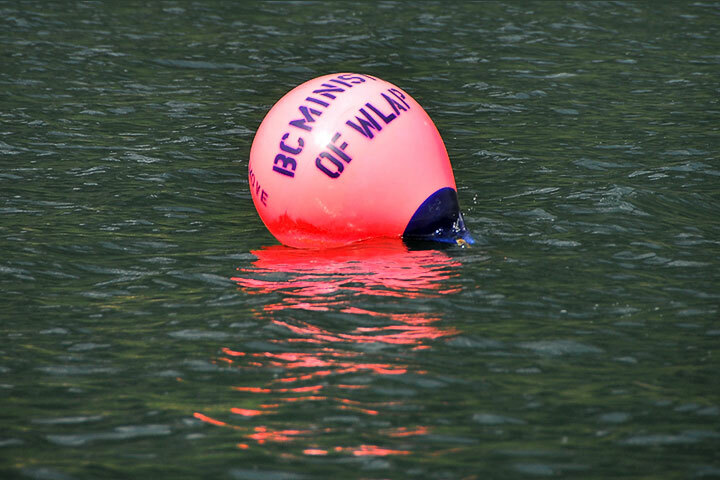 Fish monitoring buoy The dozens of orange buoys on the Main Lake are part of an array of sonic listening stations that record the passage of tagged fish: white sturgeon, burbot, bull trout and rainbow trout. They are a component of an international fisheries research program involving the BC Ministry of Environment, Idaho Department of Fish and Game, and the Kootenai Tribe of Idaho. Early road Here and there along the North Shore there is evidence of a much earlier road. In this picture, the present highway is along the top, a snippet of Sundance Road is in the bottom right, and the supporting rock wall for an old road is across the middle. It is most easily seen in the winter when not hidden by vegetation. I don’t know the antiquity of this road. A gravel road along the North Shore in the 1930s and 40s was straightened and paved around 1950. Is this a remnant of that gravel road or an even earlier one? Mile post Near the base of Hamilton Road is what is apparently the only remaining mile post for the old road along the North Shore. 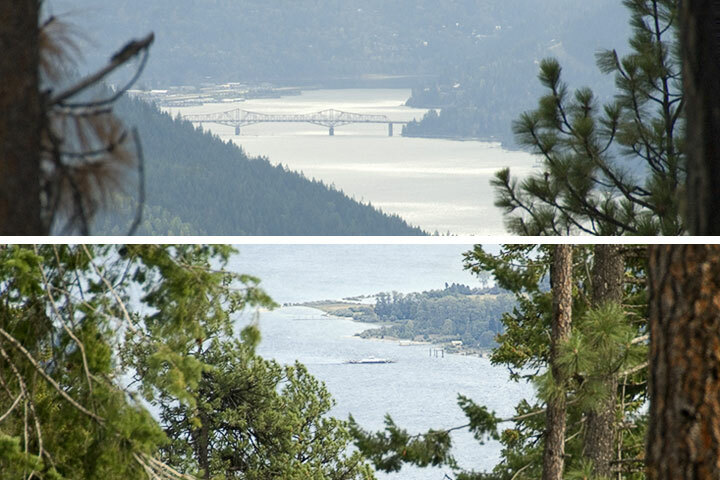 This pair of pictures—the Nelson Bridge; the Harrop Ferry—were taken from the same spot on a Forest Service Road above the West Arm. So, where is that road?